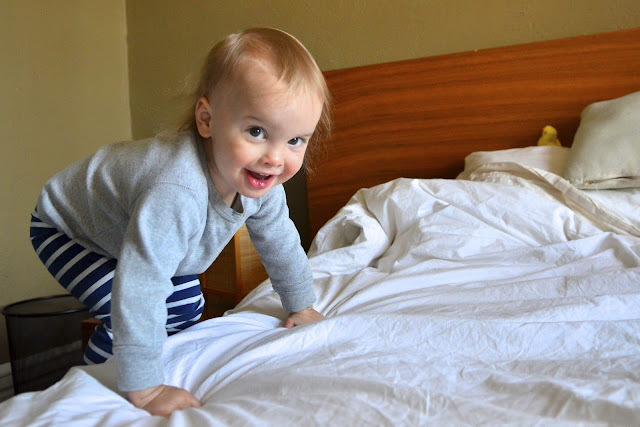 One little monkey jumping on the bed! We had a very busy day at the Linden household, preparing for a Mother's Day Tea we are hosting tomorrow. As Tyler was working, I had my little sidekick with me all day long. My arms and back are sore from lugging him around more than usual - I think he's nearing 30 lbs! After his nap (which was unfortunately shorter than normal), I was in the middle of baking a million things so I turned on good old Sesame Street. He didn't last long. By the time my husband got home at 6:30, I'd strategically built a fort in the kitchen and he was watching the Chipmunks. Normally I'm the last person to suggest tv to a toddler, but some days it's hard to get things done. Today he also started to call out to me 'Mommy Look' - about every 10 seconds, and would repeat it until I took careful note of whatever it was that caught his attention. We found time to jump on the bed together, and read a few books, and build some blocks. Soren is also my best laundry partner, saying 'thank you mommy' for every single item that he puts in the washer or drier. I love having this little guy around, and on Mother's Day tomorrow I will be thinking about all the wonderful things we've experienced together over the past 23 months. Haha I love that he says "thanks" whenever you give him something to put in the washer or drier. That's awesome. I love that you have a little washing helper- just like me! It takes twice as long, but no where near as fun! I love bed jumping, block and book days too!